A Canadian and a Briton charged with vandalism for spray painting graffiti on a wall in northern Thailand face up to 10 years in prison if found guilty, police said on Friday. Two tourists charged with vandalism for spray painting graffiti on a wall in northern Thailand face up to 10 years in prison if found guilty, police said on Friday. Canadian Brittney Schneider and Briton Furlong Lee, both 23, were arrested at a guest house in Chiang Mai on Thursday and are being held at the provincial court, police said. 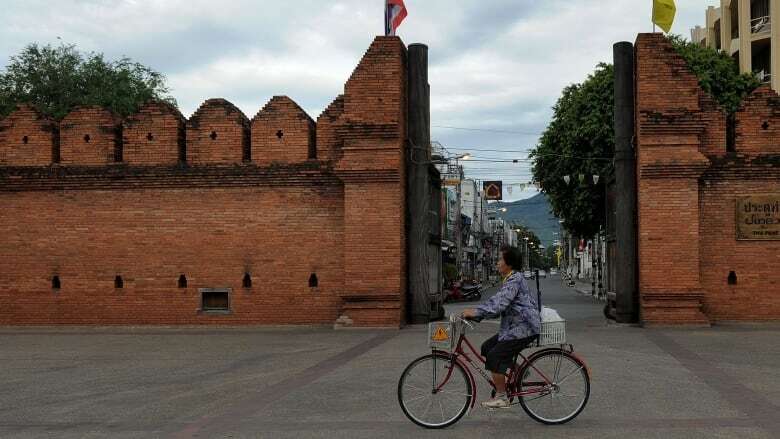 CCTV video footage allegedly showed the pair spray-painting a red brick wall near Tha Phae Gate, the main entrance to the city's old town. "They admitted to the crime," Police Major Anon Cherdchutrakulthong told Reuters. "When people visit somewhere they should know not to [leave] graffiti." Anon said they do not yet have a lawyer, adding that the young man and woman showed signs of having been intoxicated. Video footage obtained by Reuters showed the words "Scouser Lee" painted on the wall in an apparent reference to the English city of Liverpool. Thai police did not confirm Lee's hometown. The pair face up to 10 years in jail, a fine of up to one million baht ($40,035 Cdn) or both, if found guilty, police said.